Everybody knows about Hawking radiation. It’s been on TV. See the YouTube clip from the Channel 4 documentary Stephen Hawking: master of the universe. That’s where Kim Weaver of NASA says black holes offer an ultimate test of the physics of the universe. She says they’re cauldrons of heat and light with jets and particles coming out at half the speed of light, and an enormous amount of stuff going on. She finishes up saying and that’s exciting. I absolutely agree. Because yes, I think black holes can help us to understand the universe. Because as Hawking said, the universe is like a black hole in reverse. The trouble is that when you know how gravity works, you know that light curves because “the speed of light is spatially variable”. That means light goes slower when it’s lower, and that means the ascending light beam speeds up. However in his 1966 paper on singularities and the geometry of spacetime, Hawking talked of “such a strong gravitational field that even the ‘outgoing’ light rays from it are dragged back”. That’s wrong. In a strong gravitational field, outgoing light rays aren’t dragged back. They speed up even more. That tells you something about Hawking radiation: Hawking didn’t understand the first thing about gravity, and he didn’t understand the first thing about black holes either. He says it’s gently sizzling away. But eventually it gets smaller and smaller and hotter and hotter, until eventually it gets so hot that it essentially explodes. It loses all the rest of its mass in a very very short time. BOOM! It all sounds plausible enough. Particularly since you can read much the same thing on Scholarpedia, and in chapter 7 of Hawking’s 1989 book a brief history of time. Hawking said he was excited with his 1970 discovery that the area of an event horizon cannot reduce. He said he couldn’t get to sleep, and called Roger Penrose the next day to say “the non-decreasing behaviour of a black-hole’s area is very reminiscent of the behaviour of a physical quantity called entropy”. He talked about the second law of thermodynamics, and about temperature, and about gas in a box. He talked about throwing the box into a black hole, and how Jacob Bekenstein suggested the area of the event horizon was a measure of the entropy. Hawking said this seemed to prevent the second law of thermodynamics being violated, but that the fatal flaw is that if a black hole has entropy, then it ought also to have a temperature. Hawking said these particles are virtual particles, and that since energy cannot be created out of nothing, one of the particles will have positive energy, and the other will have negative energy. He said “a real particle close to a massive body has less energy than if it were far away, because it would take energy to lift it far away against the gravitational attraction of the body”. That’s true enough. But there are other things that aren’t. Jones says “the particle that gets absorbed by the black hole has a negative energy relative to the outside universe”. The Wikipedia Hawking radiation article tells the same story: “vacuum fluctuations cause a particle-antiparticle pair to appear close to the event horizon of a black hole. One of the pair falls into the black hole while the other escapes. In order to preserve total energy, the particle that fell into the black hole must have had a negative energy”. The article actually gives two variations on the theme. One says Hawking radiation “is a result of virtual particles being ‘boosted’ by the black hole’s gravitation into becoming real particles. As the particle-antiparticle pair was produced by the black hole’s gravitational energy, the escape of one of the particles lowers the mass of the black hole”. The other says “the process is a quantum tunnelling effect, whereby particle-antiparticle pairs will form from the vacuum, and one will tunnel outside the event horizon”. However there are some serious problems with all this. For starters Hawking said “the gravitational field inside a black hole is so strong that even a real particle can have negative energy there”. That’s garbage. Mass varies with gravitational potential, not with the force of gravity, and the mass deficit cannot exceed the mass you started out with. Do you know of any negative-energy particles? No. Me neither. Nobody has ever seen a negative-energy particle, just as nobody has ever seen a pencil less than 0cm long. That’s because the mass of a body is a measure of its energy-content. You can remove energy from a thing just as you can shorten a pencil. However when you remove all the energy from a thing it just isn’t there any more, just as a pencil shortened to 0cm isn’t there any more. You cannot then remove more energy to create a negative-energy particle, just as you cannot shorten a pencil to less than 0cm long. There’s another serious problem in that pair production typically results in the creation of an electron and a positron. Both have a positive mass-energy. Neither has a negative mass. If they were somehow produced from the vacuum near the event horizon, the chances are that the black hole would swallow them both, and would therefore grow by consuming vacuum energy. On top of that Hawking said black holes emit black body radiation, which is electromagnetic radiation. That consists of photons, not electrons or positrons, and photons don’t have a negative mass. Or a negative energy either. If that wasn’t enough, virtual particles are virtual. As in not real. They aren’t short-lived real particles that pop in and out of existence like magic. Instead they only exist in the mathematics of the model. Hydrogen atoms don’t twinkle, magnets don’t shine, and space is not full of virtual particles constantly popping in and out of existence. Moreover virtual particles are not the same thing as vacuum fluctuations. Vacuum fluctuations are real, as per the Casimir effect. You can liken them to tiny ripples on the surface of the sea. But gravitational time dilation is infinite at the event horizon, so any vacuum fluctuations would take forever to fluctuate. So there wouldn’t be any vacuum fluctuations. It gets worse. See Hawking’s 1978 physics bulletin article black holes and unpredictability. That’s where Hawking said this: “one could think of the member of the pair which fell into the hole (say, the antiparticle) as being a particle that was travelling backwards in time. It would come from the singularity and would travel backwards in time out of the black hole to the point where the particle-antiparticle pair first appeared. There it would be scattered by the gravitational field into a particle travelling forwards in time”. Particles travelling back in time that then bounce off something such that they then travel forward in time? Oh Really? No, not really. It is total trash. Like all other aspects of the so-called explanation of Hawking radiation. Particles do not pop into existence, spontaneously, like worms from mud. There are no negative energy particles. There are no magical pairs of particles that behave just so, such that the particle with the negative energy obligingly falls into the black hole whilst the particle with the positive energy escapes to infinity. Particles do not travel backwards in time. Moreover there is no alternative explanation of Hawking radiation. The truth is that it’s all just one big fairy tale. It’s all just lies to children. A whole pack of them. Some people are unhappy to hear that there are such problems with Hawking radiation. That’s because when people have heard something time and time again for decades, some of them end up believing in it. Especially if they were young and tender when they first heard of it, hence the expression catch ‘em young. Then some of them want to keep on believing in it. Then if you describe the problems that challenge their belief, they can react emotionally. They may dismiss the problems and say things like “we have evidence of Hawking radiation”, even though we don’t. They may point to articles such as a lab-made black hole just gave us the strongest evidence yet for Hawking radiation. They may point to the part that says “we observe a thermal distribution of Hawking radiation, stimulated by quantum vacuum fluctuations”. Or to the part that says “this confirms Hawking’s prediction regarding black hole thermodynamics”. But they don’t point to the part that says “emanating from an analogue black hole”. Instead they point out that the article is referring to a paper in Nature. And that papers in this prestigious journal have been subject to peer review by the experts in the field, and are therefore authoritative and correct. Then comes the smug expectation that members of the public won’t access the paper because of the paywall, and therefore can’t pursue the point. But thanks to sci-hub, they can. Key in the doi of 10.1038/nphys3863, and there it is: observation of quantum Hawking radiation and its entanglement in an analogue black hole by Jeff Steinhauer. That’s the analogy that portrays a gravitational field as falling space instead of inhomogeneous space. It’s total trash too. A gravitational field alters the motion of light and matter through space, it doesn’t make space fall down. We do not live in some Chicken-Little world where the sky is falling in. So this analogy isn’t evidence for Hawking radiation. Because whilst the waterfall analogy is said to be simple and intuitive, it’s wrong. It’s just another fairy tale. It’s yet more lies to children. So can we find something that isn’t lies to children? 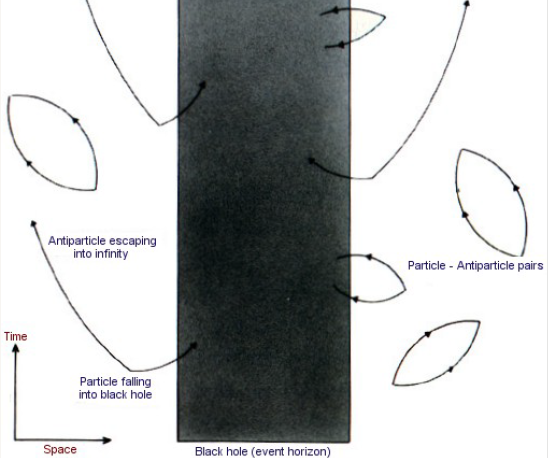 Take a look at John Baez’s 1994 Hawking radiation article on physicsFAQ. It was modified by Ilja Schmelzer in 1997 but not in any significant way. Baez asked how Hawking radiation works and said a lot of pop-science treatments explain it like this: “virtual particle pairs are constantly being created near the horizon of the black hole, as they are everywhere. Normally, they are created as a particle-antiparticle pair and they quickly annihilate each other. But near the horizon of a black hole, it’s possible for one to fall in before the annihilation can happen, in which case the other one escapes as Hawking radiation”. It’s the same old fairy tale. But then to his credit Baez said this: “in fact this argument also does not correspond in any clear way to the actual computation”. He said in the last talk he was at it was emphasized that nobody has ever worked out a local description of Hawking radiation in terms of stuff like this. That’s good to hear. Baez then said the usual computation involves Bogoliubov transformations and he talked of Maxwell’s equations and more. But he didn’t offer a better explanation. Instead he ducked the issue. He ended up saying “hopefully whoever made up the usual heuristic explanation understood the link better than I do!” Only it was Hawking himself who made up the usual heuristic explanation, and like I said, it’s garbage. I’m not the first person to say this. The trouble is Hawking was always a “media darling” on account of the wheelchair and his medical condition. If anybody did criticize him, the media were unwilling to publicize it. So you probably never got to hear about it. But scratch the surface, and you can find it. See Andrew Hamilton’s article on Hawking radiation. His April 2003 update refers to Adam Helfer’s paper do black holes radiate? Helfer said “the prediction that black holes radiate due to quantum effects is often considered one of the most secure in quantum field theory”. But then he said “this prediction rests on two dubious assumptions”. He also said that according to Belinski there are problems which may not be fixable. And that until we have an understanding of quantum gravity “no compelling theoretical case for or against radiation by black holes is likely to be made”. It’s stern stuff. All the more so because “Hawking’s calculations apply directly only to massless linear fields, and no such fields are believed to exist in nature”. And because “none of the derivations that have been given of the prediction of radiation from black holes is convincing”. And because “the connection between black holes and thermodynamics remains inadequately understood”. The more you scratch the more you find. You find Mario Rabinowitz’s 2004 paper on black hole paradoxes. Section 5 is why Hawking radiation may not exist. He ended up saying “the paradoxes and inconsistencies engendered by Hawking radiation trouble me”. On the way he referred to the 1992 book black hole physics which you can download from a website called Bookzz. It’s edited by Venzo De Sabbata and Zhenjiu Zhang. On page 280 De Sabbata and Chandra Sivaram said “thus one may observe the decay only if one makes an infinite succession of measurements”. They were saying it takes forever to see Hawking radiation. They referred to the Zeno effect as opposed to Zeno’s paradox, but I think they’re right anyway because of that infinite gravitational time dilation. Rabinowitz also refers to Robert Wald saying he makes “incisive observations that can be interpreted as being critical of Hawking radiation but not as critical as those of Belinski”. Rabinowitz said Wald said the actual physical thermal emission had not been derived. Wald is quite well known in physics circles. He specializes in general relativity and thermodynamics. If he’s critical that’s surely worth a look? You can read what Wald said starting on page 55 of black hole physics. His chapter is black holes and thermodynamics. He tried to make a case for black hole thermodynamics but whilst he offered a whole lot of assertion and abstraction, he didn’t offer much physics. On page 67 he said “we view a black hole as being analogous to an ordinary dynamical system with many degrees of freedom”. This isn’t justified. On page 68 he said the analogy between laws of black hole physics and thermodynamics is strongly reinforced when one compares equations 18 and 19. But it isn’t, it’s just two equations of similar form. On page 69 he rightly said in classical black hole physics “κ has nothing whatever to do with the physical temperature of a black hole, which is absolute zero by any reasonable criteria”. Good. He then said this situation changes dramatically when quantum physics is taken into account. However the “reasonable criteria” for that are totally lacking. On page 78 he said “although the above constructions give a very elegant (and intriguing) way of associating a thermal state to extended Schwarzschild spacetime, they do not “derive” thermal emission by black holes, i.e., they do not show that the thermal state IO>HH will plausibly arise by some physical process”. That’s the criticism. However I have to say it comes across a caveat rather than a genuine criticism. Particularly since in later versions of black holes and thermodynamics Wald wasn’t critical at all. Wald’s 1984 book General Relativity is similar. You can download it from various websites. Baez said it gives a good precise introduction to the subject in sections 14.2 thru 14.4. But in section 14.2 on page 389, Wald talked of Hilbert space and open balls and Cauchy sequences in infinite dimensions, and about the theory of a free real Klein-Gordon scalar field in Minkowski spacetime. Even though the Klein-Gordon equation doesn’t describe real particles, and Minkoswki spacetime is a static mathematical model of space at all times. Wald talked about the symmetric Fock space and annihilation and creation operators, which presupposes particle creation. He gave ten pages of mathematical abstraction, then in section 14.3 on page 399 he declared that “spontaneous particle creation near a Kerr black hole does indeed take place”. He said the most dramatic result was “Hawking’s discovery that particle creation also occurs near a Schwarzschild black hole”. As if a mathematical proof is somehow on a par with hard scientific evidence. He referred to white hole horizons and future null infinity and said it might be expected that particles are created during the collapse and then cease, but that “this is not what Hawking (1975) found”. As if Hawking saw it through a telescope. On page 404 Wald said “the nature of the classical scattering relevant to the quantum particle creation effect is best analyzed by considering the propagation of waves backward in time”. Backwards in time! It isn’t a good precise introduction at all, it’s utterly unconvincing. On page 337 Wald said temperature T is analogous to κ denoting the force of gravity at the event horizon. He said energy E is analogous to mass M, and entropy S is analogous to area A. He said “Hawking discovered that quantum particle creation effects result in an effective ‘emission’ of particles from a black hole with a blackbody spectrum at temperature T=ħκ/2π”. Then he said “thus, κ does physically represent the thermodynamic temperature of a black hole!” It’s a quantum leap, from a superficial resemblance to magisterial certainty. Particularly because temperature is an average measure of motion, and infinite time dilation means there is no motion. Particularly because on page 332 Wald said the locally exerted force becomes infinite at the horizon. Even though the force relates to the gradient in the “coordinate” speed of light, which is zero at the horizon and can’t go lower than that. So there is no force at the horizon. So it isn’t a close mathematical analogy at all. It’s a mathematical coincidence, followed by mathematical smoke and mirrors and handwaving, followed by a flourish and a rabbit from a hat. No wonder Belinksi was so critical. Vladimir Belinski wrote a paper in 1995 on the existence of quantum evaporation of a black hole. His abstract is brief and to the point: “a conjecture is made that the standard derivation of the black hole evaporation effect which uses infinite frequency wave modes is inadequate to describe black hole physics. The proposed resolution is that the problem is not due to the absence of the as yet unknown ‘correct’ derivation but rather that the effect does not exist”. Belinski went on to say he thought Hawking radiation was a mathematical artifact resulting from the inadequate treatment of singular quantities. His paper was reported by New Scientist, but they gave more airtime to Hawking’s colleague Gary Gibbons, who said similar cutoffs have been used to remove troublesome infinities in quantum electrodynamics. That doesn’t cut much ice if you know that the electron isn’t a point particle. Or if you know that QED suffered badly from the problem of infinities. So much so that some historians say most workers in the field doubted its correctness, some say the accepted wisdom was that it was no good, whilst others say physicists were overwhelmed by the problems and believed that a conceptual change was needed. Only it didn’t happen. Because the problems ended up getting swept under the carpet by renormalization. Which somehow ended up getting sold as a virtue instead of the hocus-pocus kludge it really was. In Belinski’s 2006 paper on the existence of black hole evaporation yet again he talks about the groundlessness of the conventional picture. He says a body which can only absorb and not radiate “cannot reach an equilibrium with the environment, so that in principle thermodynamics cannot be applied to black holes”. He adds that no physically sensible notions of temperature and entropy can be defined for them. Belinski also wrote a 2009 paper on tunnelling through the black hole horizon which he revised in 2012. He said there’s no way for particle creation to occur by quantum tunneling through the event horizon. His section 1 is “on some delusions existing in the literature”. He ends up saying the whole idea of black hole thermodynamics collapses together with the concept of black hole entropy, and that there’s no trace of any information paradox any more. There’s no trace of any evidence for Hawking radiation either. Even after 44 years. And still nobody has shown how Hawking radiation arises from any plausible physical process. The bottom line is that Belinksi is right. You only have to think about it for a minute to know he’s right. If you were going to drop a box of mass M into a black hole, you could choose the low-entropy box with the hot gas molecules all in one corner, or the high-entropy box with mixed-up gas molecules. Either way the black hole mass increases by M. The area of the event horizon is related to the black hole mass, so the area increase is related to the mass of your box and contents. The entropy doesn’t matter one iota. Not a jot. Of course to know for sure that Hawking was winging it with his mathematical smoke and mirrors and handwaving, to know for sure that it’s all just a pack of lies-to-children and fairy tales, to know for sure that Hawking radiation is bunk, you need to read the Einstein digital papers. And the Hawking papers too.